Today’s biomedical researchers are increasingly required to adopt technologies that enable data-driven collaboration, improve data management, and ensure compliance with ethical, legal and regulatory requirements. Dynamic consent is a technology-led approach to patient consent which can develop ongoing partnership between participants and researchers. Dynamic consent provides personalised online platforms which enable the attainment and management of informed consent and allow open dialogue between researchers and participants. Traditionally, consent is captured face-to-face for a specific use, which can be problematic for application in biobank research, in which samples are used for multiple purposes over time. Currently individuals can provide broad or blanket consent to a range of different future research purposes. However, they cannot update their preferences if research activities change. In such cases, consent must be re-requested from the participant, who must re-read lengthy forms containing complex terminology, which can affect retention. It isn’t abnormal for clinical trials to require costly extensions and the inability to effectively engage participants and obtain consent is detrimental. Moreover, as research becomes more heavily influenced by the increasing availability of clinical data from electronic health records, biorepositories, and so on, methods of patient consent management must stay aligned and improve at the same pace. 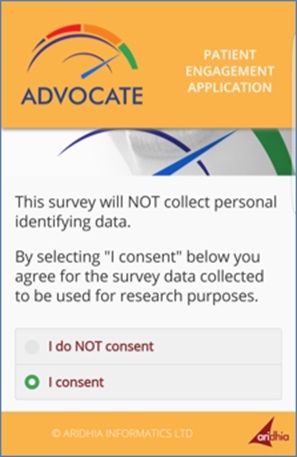 Modern methods of dynamic consent and digital interfaces should be considered to allow consent preferences to travel with the data and engage participants of clinical research in the work to which they are contributing. Now phones, tablets and laptops are commonplace, it is easy to envisage how an online consent app or platform could handle some of the issues experienced by researchers, such as participants’ unwillingness to travel to a research centre, finding the right population to contact, recruitment and, later, patient retention. Displaying information about a research project in a user-friendly way via easily-accessible online platforms could solve some of these problems. Furthermore, scepticism about stratified medicine and pharmacogenomics, particularly regarding the use of genetic information and identifiable data, needs to be overcome. 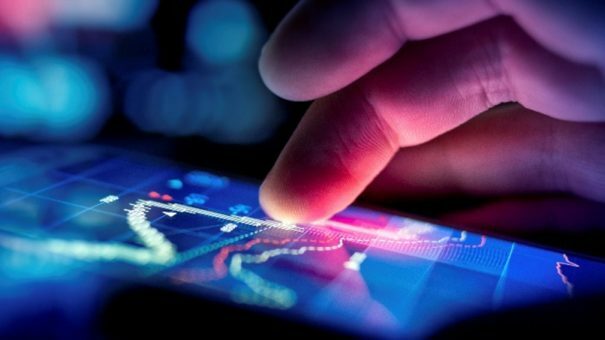 If patients could use their phones or tablets to manage their consent preferences and choose where their samples and information were shared, such openness and clarity could boost trial participation, which is particularly important to trials with stratification and small target populations. The issue of trial participation alone is a considerable one. FCB Health’s Angela Radcliffe (@radclipatra), a leading proponent of stimulating innovation in clinical study engagement, recently described trial participation as “dire”. In a recent pharmaphorum article she explained, “For all the effort being put into driving awareness, trials continue to be significantly challenged by lack of participation.” Platforms or apps which support dynamic consent could be the key to improving healthcare literacy, increasing numbers of first-time trial participants and making participation more widely accepted. What might a dynamic consent platform look like? A recent project at the REshape Innovation centre (@reshape), at Radboud University Medical Centre (@radboudumc) in the Netherlands, brought together patients, local ethics committees, privacy experts and researchers to create an app that allows users to create their own data-sharing policies and choose the types of studies for which they give consent for use of their data. The Dutch app that allows users to create their own data-sharing policies. The centre aimed for patient empowerment and invited patients to feel a part of the healthcare team. 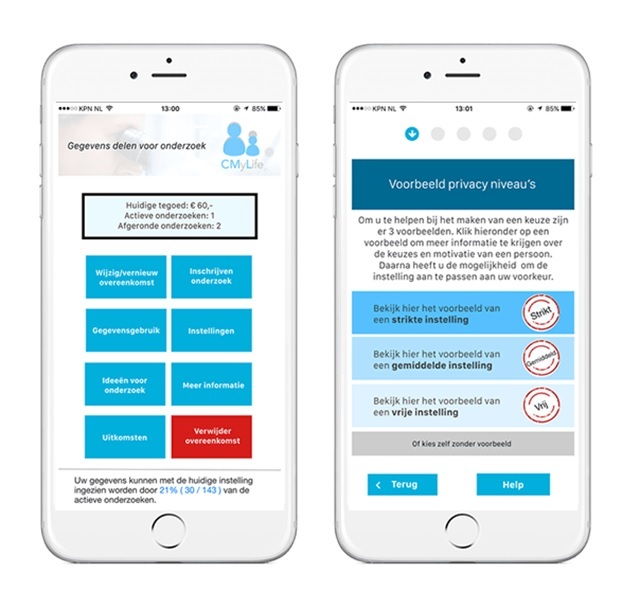 The work led to the creation of an app prototype that would enable patients to manage their own consent preferences via an interface which included buttons such as ‘Data Usage’ and ‘Remove Agreement’ and an option to view more information on different levels of consent. An app for patient consent to use data in an oral healthcare project. Our own recent ADVOCATE oral healthcare project, funded by the European Commission’s Horizon 2020 programme, has created a patient app allowing participants to become involved in their own care, providing their consent to participation in a data-gathering questionnaire accessible from a tablet at their practitioner’s clinic. Ultimately the project, which spans six European countries, will generate insights into the state of dental care to inform the design of an innovative healthcare ecosystem which promotes a patient-centred, evidence-informed oral healthcare model. While not specifically an example of dynamic consent, successful implementation highlights the compatibility of consent processes with mobile devices. Importantly, users are comfortable with the design and usability of web-hosted consent portals and like to see their involvement in research being valued. The average person in the UK spends 2 hours a day online on a smartphone. So it is easy to see how a dynamic consent platform may benefit recruitment, participation and participant confidence in data sharing. Perhaps the best element of platforms which support dynamic consent is their ability to open a dialogue with participants. Research confirms that patients are more likely to enrol in future research if they are kept informed about how the research is progressing. Therefore, it is important that patients understand which data is held, how it is being used, and how it has benefitted research and healthcare. A portal which permits this sort of interaction between participants and researchers would be extremely useful and is key to the progress of data-driven research. As data de-identification facilities become more common, less static models of consent are needed. Current consent methods do not adequately address today’s ability to link datasets from different sources, all of which have different degrees of consent. Consent preferences should, therefore, travel with the data they represent. Multidisciplinary, international collaborations are becoming more common as different organisations pool resources to tackle difficult problems in healthcare. For example, the Stratified Medicine Scotland Innovation Centre pulls together collaborative networks across industry, academia and healthcare. Traditionalists may view dynamic consent and paperless approaches sceptically, and researchers would have to be prepared to answer questions from participants who would be more involved in the research. However, the benefits of participant-centric approaches cannot be ignored. They have the potential to optimise participant engagement in research by permitting two-way dialogue, improve participation and retention, reduce the cost of patient management and improve attitudes towards data sharing for research. Kieran Bond is a Data Analyst at Aridhia. He holds an MSc in Stratified Medicine and Pharmacological Innovation. 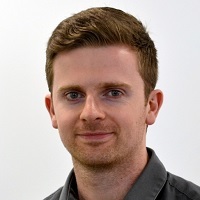 Kieran supports preclinical studies across multiple disease areas and enables users to collaboratively analyse research data with the AnalytiXagility platform.